A rush drill with backpressure that results in OZ/DZ play. Three X forwards start on the hashmarks of the faceoff circle, two O defensemen start on the blueline. Coach rims a puck around the boards, the forwards pick it up and attack 3v2. As soon as the puck is rimmed, two X defensemen come around the net and activate into the rush, at the same time 3 O forwards come around the net and backcheck to the defensive zone. 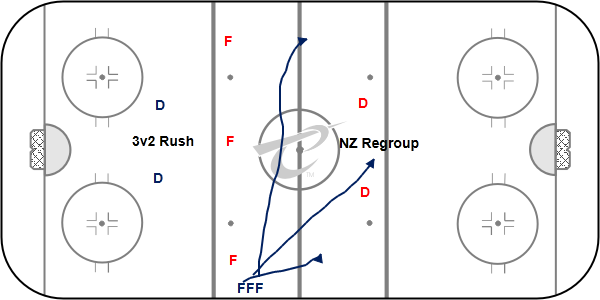 Once the rush is played out (a 3v2 with one or two activated D and backcheckers), the teams play 5v5 in zone. 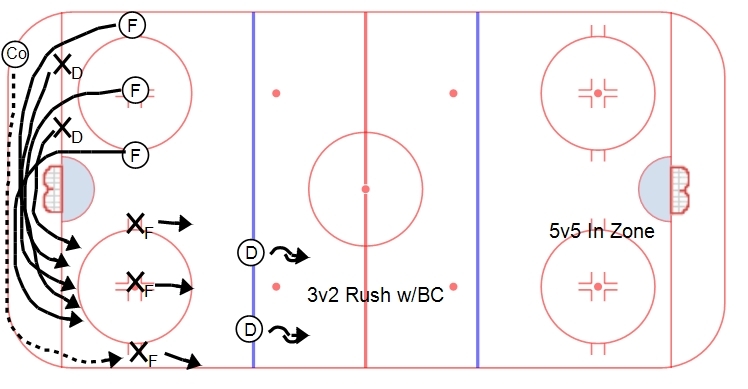 This drill works on initial rush concepts, funnelling/backchecking to the defensive zone, and in zone play on both offense and defense. A good drill that allows coaches to install systemic play in zone.